The region around Buck’s Pocket State Park, South Sauty Creek, and Morgan’s Cove (Site # 49, Northeast Loop) provides a number of habitats worthy of exploration. The waters of South Sauty Creek are attractive to numerous migratory waterfowl, as well as Great Blue Herons and Great Egrets. Just downstream from the boat landing at Morgan’s Cove, Bald Eagles are known to nest on the forested slopes above the creek. 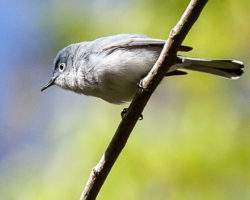 Buck’s Pocket State Park’s wooded pocket canyon is complete with singing Red-eyed Vireos, Wood Thrushes, and Scarlet Tanagers. The park is also host to some interesting surprises during migration. Morgan’s Cove is part of the state park, too. This secluded cove is the perfect spot to watch Belted Kingfishers diving for their dinner or to launch a canoe and paddle your day away. Directions: From the intersection of AL Highway 227 and AL Highway 62 just north of Guntersville State Park, go 4.4 miles east on Highway 227. Turn left at the Morgan’s Cove Park Sign and go 1.1 miles down the hill to the cove.